Stake bed trucks have been hauling merchandise and supplies for the last 100 years. The Classic Metal Works 1946 Chevy stake bed truck is a great model (available in HO and N scale versions) for all transition-era layouts. However a detailed load is needed for this truck to really set the scene. 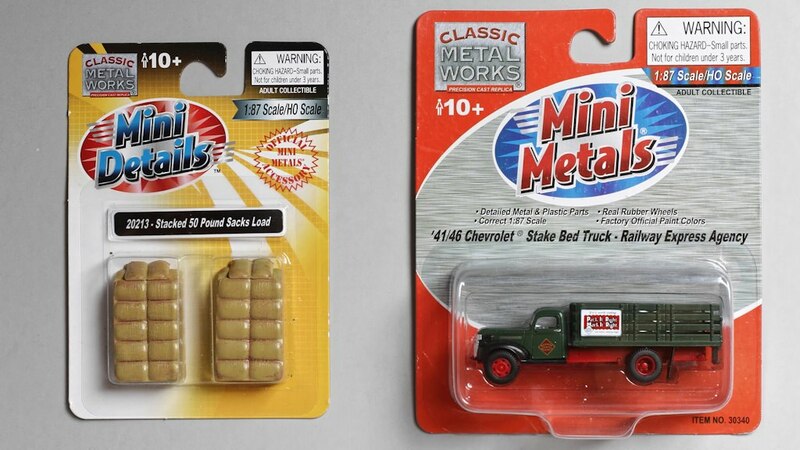 Recently Classic Metal Works added a Mini Details line of truck loads. They are packaged as two pre-painted loads to a card. The available loads include 55 gallon drums, stacked wood crates, stacked shipping cartons, and 50 pound sacks. The most interesting looking ones are the barrels and sacks. My HO scale Saint Louis Southern goes through a lot of farmland, so there’s always sacked supplies that need delivery. 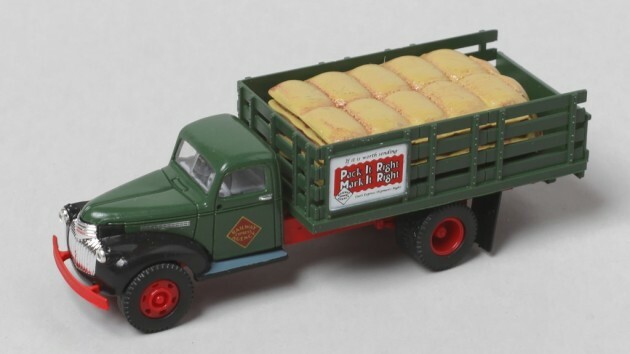 The new Classic Metal Works Mini Details #20213 sack loads with the #30340 1946 Chevy REA stake bed truck. As you would expect, the #20213 sack loads are a perfect drop fit into the bed of the CMW stake bed truck (such as the #30340 REA version shown here). Since they’re already painted, it’s a one minute project. The load would look a little better with a quick coat of Testors Dullcote or some other dulling spray. The Classic Metal Works 1946 Chevy stake bed truck loaded with the Mini Details sack load. 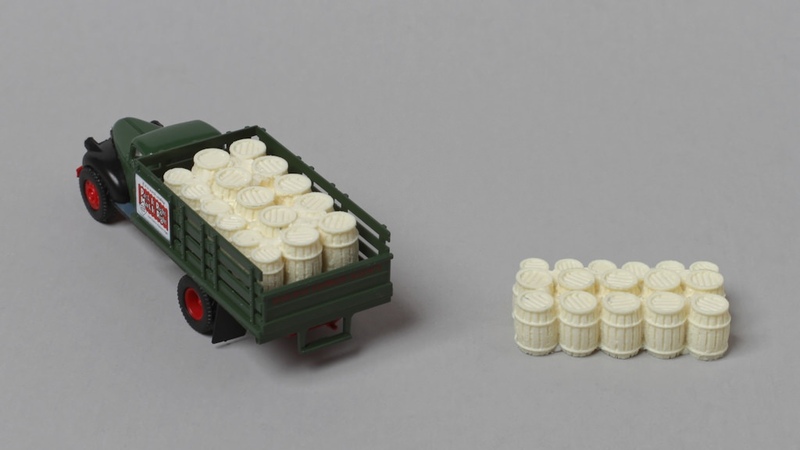 There are other resin details that make equally excellent loads for this truck. The Model Tech Studios #D0178 “HO Super Piles Wooden Barrels” and Bar Mills #02009 “Wooden Crate Stacks” contain unpainted castings that are also a drop fit for the 1946 Chevy stake bed. They’re unpainted resin, so you will need to wash, paint, and weather them before installation. I’m showing the unpainted castings here. 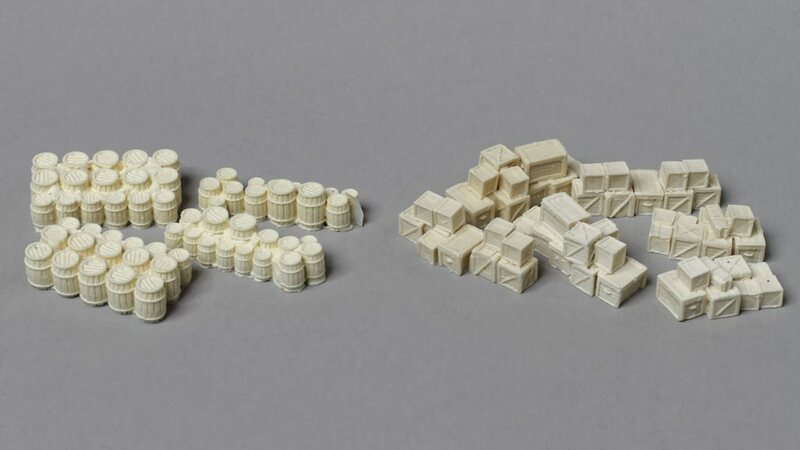 Model Tech Studios #D0178 “HO Super Piles Wooden Barrels” (at left) and Bar Mills #02009 “Wooden Crate Stacks” (at right) unpainted resin detail sets. The two larger groups of barrels from Model Tech Studios #D0178 fill the bed of the truck. Model Tech Studios #D0178 wooden barrel load in the Classic Metal Works 1946 Chevy stake bed truck. All six of the Bar Mills #02009 castings each make an excellent crate load. 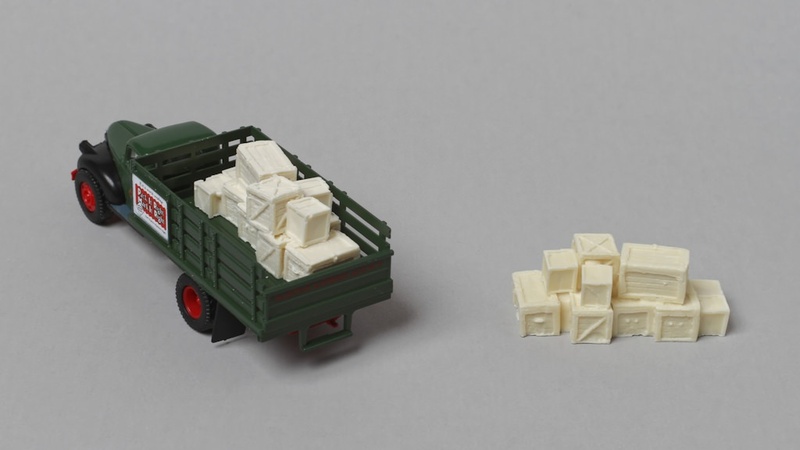 The largest casting from the package is shown here as the load. One of the Bar Mills #02009 “Wooden Crate Stacks” castings in the Classic Metal Works 1946 Chevy stake bed truck. Adding logos to the sacks or stencils to the crates would provide additional fine detail. 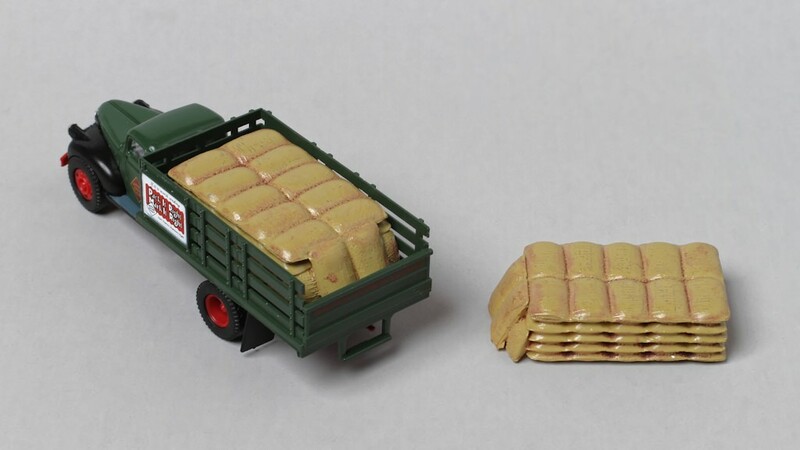 Appropriate dry transfers and decals are available from a number of sources such as Woodland Scenics and Microscale. The truck, loads, and castings in this article were all purchased at retail from an online hobby shop.